SS: Tell us a little bit about Oak Labs and what you do. OL: Oak Labs is a SF-based retail innovation company, creating a simple platform for evolving, digital retail experiences in the physical world. Started in 2015 by the founders of eBay’s Retail Innovation division, the team is comprised of retail, e-commerce, manufacturing & technology experts. The Oak Mirror, the first iteration of the company’s interactive retail solution, is currently available in select retail locations worldwide, including Polo Ralph Lauren and Rebecca Minkoff stores. SS: What inspired Oak Labs? Did you feel something was missing in the current retail landscape? OL: The last decade has seen an acceleration of mobile technology, which has continued to condition consumers' expectations of how they interact with the physical world. The retail industry is really struggling to keep up- we can see this in the headlines everyday as retailers (from sporting goods to iconic fashion houses) are shuttering their doors by the dozens. The industry is at an inflexion point, and many consider the future of retail to be in peril - but there is so much that can be done to solve some real customer pain points and begin to bring brick & mortar into the 21st century. This is where Oak comes in. At Oak, we only introduce technology that solves a specific problem. We identify points of friction in a customer journey, and create technologies & strategies to solve them. Fitting rooms are a real problem. They are the place of the highest conversion in-store (⅔ of fitting room sessions convert to purchase) from your best customers (who spend 80% more than shoppers who don’t make it into the fitting room), yet, it is the place of highest dissatisfaction in the retail store. The Oak Mirror targets some of the greatest pain points of shoppers, enabling them to change lighting seamlessly, requests specific items or general help from a sales associate without leaving the room and (our latest feature!) pay directly by tapping their phone to the mirror. OL: Rebecca and Uri Minkoff are true thought-leaders in retail, and have consistently proven to be ahead of the curve when it comes to breaking the rules of commerce in-store, online and in how they run their business. We’re thrilled to partner with such an innovative team. SS: Was it hard to sell the idea of advanced technology to a mainstream fashion brand? OL: When Oak was founded back in 2015, the retail industry was on the brink of some massive change- paradigms and practices that had driven the industry forward for 100+ years were failing, and fast. Over the past 2 years we have pleasure of hearing the voices of the industry, from shoppers to landlords, from CEOs and sales associates, from big box and high luxury brands. The question I’ve heard time and again, “What will the store of the future look like?”. We believe the future will be software defined and technology will play a major role in optimizing the in-store experience, but human interaction will remain key to commerce. We have received a resoundingly positive reaction to our mission and the results we’ve seen to date, reinforcing this exciting (and achievable) vision we’ve built Oak around. SS: What do you think consumers and people in the fashion community get wrong about tech? OL: Oh boy, where to begin! 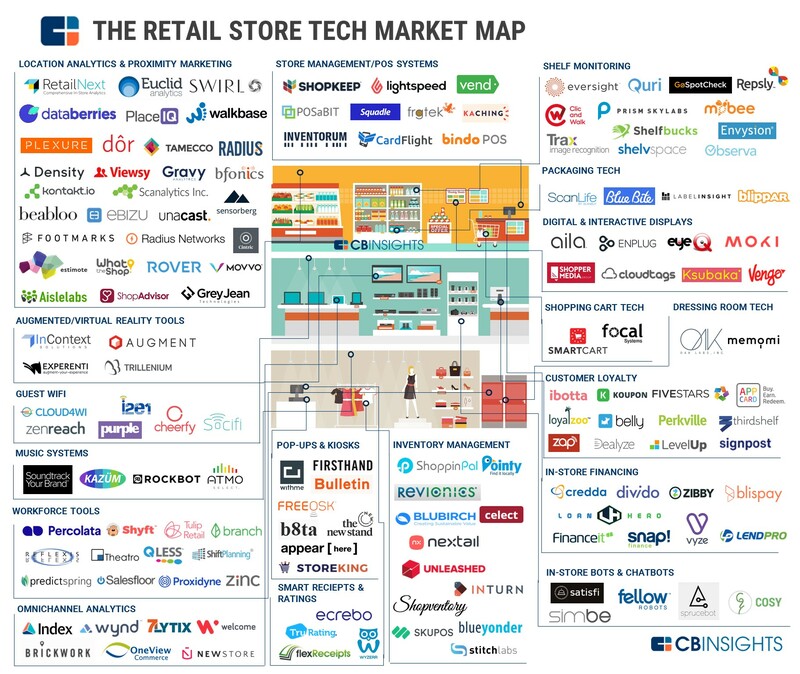 To be fair, there is a dizzying amount of technology and retail tech companies vying for the attention of retailers today (check out this infographic). It’s a herculean task to sort through the clutter, let alone successfully implement it. Forget Tech for Tech’s Sake: If the technology is not solving a specific problem, it’s likely not worth your time. Let’s step away from the laser beams and holograms, and think about ROI and solving real problems. First Things First: If the most basic infrastructure is not there (like, say, wifi! ), more complex technology will likely fail. Launch & Forget: Launch is not the end of the road for innovation, it’s likely a mid-way point. Assess, test, revise, rework… take your learnings and continue investing in the improvement of these experiences. Empower your Associates: The best technology doesn’t need an instruction manual, and the best tool to encourage engagement and compliance is a well trained staff. SS: What's the future of retail, in your opinion? OL: There are few industries more influential in the world than retail: it employs 1/4 people in the U.S., and is how we spend roughly 67% of our disposable income. While more than 90% of all purchases still take place in the physical store, the next few years will continue to see the wheres and hows of commerce continue to evolve. Stores will size down, optimize up & focus on customer experience. E-commerce will continue to expand via mobile to this next stage of AI driven commerce (Alexa, Siri, Google Home). Convenience and customization will define our engagements with retail brands. It’s an exciting and beautiful forecast for shoppers and retailers alike, and we’re exciting to be involved in shaping it. SS: Are there any exciting partnerships in the works? New products, perhaps? OL: Where to begin?! Just this last February, we launched NFC Payment on the mirror which will lead to tap-and-pay enabled mirrors in and around fitting rooms. Additionally, we have a few more partners we are launching the Oak Mirror with later this year along with some new features. Definitely more exciting news to come soon!